General Electric, once a reliable symbol of American success, is in turmoil at a time when the stock market is booming and the economy is gathering momentum. GE's (GE) stock price tumbled to a two-year low this week, after a series of management shake-ups failed to restore confidence in the industrial giant. 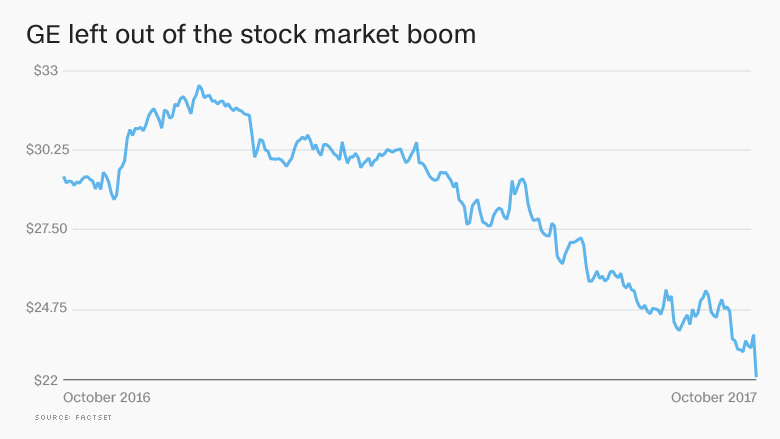 The maker of everything from jet engines to power plants has lost a quarter of its value -- roughly $70 billion -- so far this year. GE's struggles have accelerated lately, but they're nothing new. GE isn't just the worst Dow stock this year -- it's the biggest loser since 2001, the year Jeff Immelt became CEO. Under fire from angry investors, Immelt stepped down as CEO this summer. "The company has been disgraced," Scott Davis, CEO and lead analyst at Melius Research, wrote in a recent report. He added, "GE is in crisis mode and needs to clean house as fast as possible." GE, which has nearly 300,000 employees, has scrambled to take action. The company recently announced the early retirement of Immelt as chairman, and the departure of several top senior leaders, including the surprise exit of Jeffrey Bornstein as chief financial officer. The new CEO, John Flannery, is slashing costs. GE has delayed building its new Boston headquarters, grounded its fleet of corporate jets and eliminated company cars for top execs. But Wall Street isn't satisfied, which raises the prospect of more dramatic steps such as layoffs. JPMorgan said in a recent report that there's a growing chance GE will have to cut its coveted dividend. That hasn't happened at GE since the Great Recession. GE responded in a statement by saying the "dividend remains a priority." GE's failures are even more glaring given the success of its peers. The U.S. stock market is on fire, and shares of multinational rivals like Honeywell (HON) and United Technologies (UTX) are humming near all-time highs. After years of inconsistent performance, the global economy is finally enjoying a moment of synchronized growth. At home, the American economy is in the midst of one of the longest periods of uninterrupted growth ever. Analysts and shareholders blame GE's struggles on management, which is normally a source of pride at the storied company. During the '80s and '90s GE's management practices gained a cult-like following under longtime boss Jack Welch. 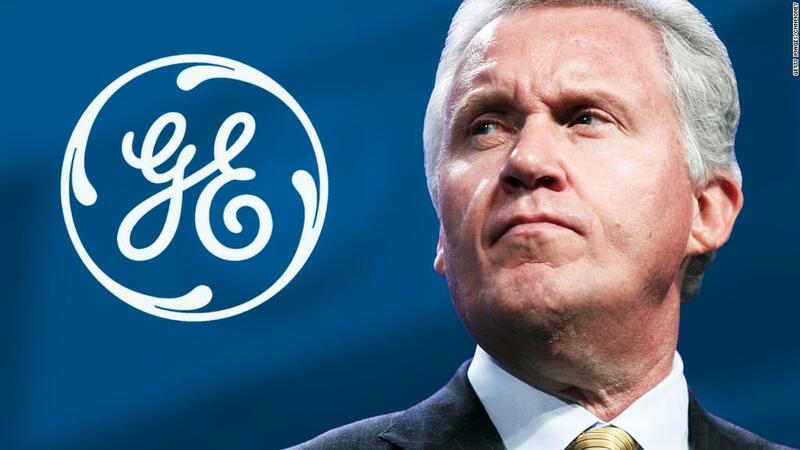 "Jeff Immelt is the CEO everybody loved to hate. The management team fell down in terms of execution," said Barbara Noverini, an analyst at Morningstar. Davis, the Melius analyst, puts it even more bluntly. He called Immelt's tenure a "train wreck" and said the former CEO's exit "came about 10 years too late." Immelt presided over GE's dismantling. He jettisoned GE's media arm, NBC Universal, and sold off most of GE Capital, its once-formidable financial arm. GE even sold off its well-known appliance business last year to China's Haier Group. Now, it's trying to unload the iconic light bulb business. The goal was to focus GE on businesses it could win in, and to get rid of the ones that were distractions. But GE's remaining businesses, which include aviation, transportation, healthcare and energy, aren't firing on all cylinders. GE's free cash flow, a key metric of financial strength, has deteriorated for six consecutive years. Flannery, GE's new CEO, is expected in the coming weeks to detail his efforts to stem the bleeding by cutting costs. Davis said he's been "impressed" by Flannery, and praised him as a "well-respected manager" who gets the depths of GE's problems. GE's businesses have such deep problems that they are "unlikely to be dug out of with simple cost cuts alone," JPMorgan analysts wrote. And the surprise exit of GE's chief financial officer shook investors. GE's stock dropped 4% on Monday following the news. Unexpected CFO departures often make investors worry that there are accounting problems around the corner. JPMorgan downplayed those concerns, saying: "We don't see evidence of accounting rules being broken here." That's good, because GE has enough problems at the moment.